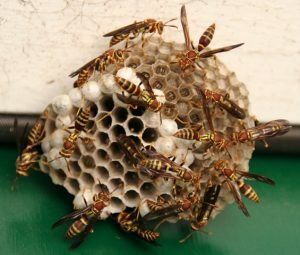 Paper wasps are considered to be beneficial insects by some people, especially gardeners. This is because they eat a variety of pests, especially caterpillars and are pollinators. They will sometimes build their honeycomb shaped nests on homes and other places where they come in frequent contact with us. If you are vigilant you can keep nests that are in inconvenient locations from getting established. Nests start with a single wasp and they do not defend them at this point so the nest can be knocked down with a broom. Once they get larger they can be sprayed with a wasp spray, EcoSmart Wasp & Hornet Killer can be found locally and works well. Try spraying wasp nests at night, when they are all on the nest. You should wear a hat and a jacket to provide some protection. Some wasps will nest inside structures, typically red wasps. These can be more difficult, so professional help may be needed.